The world’s smallest tube-based booster/overdrive pedal, the TBO-9 features a US Military spec subminiature tube at its core. Subminiatures are the final frontier of vacuum tubes, as the supply of quality vintage tubes is rapidly dwindling. Used extensively during W.W. II, subminiatures were largely abandoned by 1955 in favor of transistor technology, leaving a healthy stock of quality NOS product behind. To create its lush overdrive tone, the TBO-9 blends this subminiature tube stage with a solid-state distortion circuit. Unlike other tube overdrives, the TBO-9 employs a unique “pre-tube” circuit configuration, where the tube comes before the solid-state distortion circuit in the signal chain. By cascading the tube stage into the distortion stage, a more realistic tube-amp tone is achieved. The result is a warm yet powerful guitar tone that is extremely interactive with the player’s performance and responds exactly like a hard-working tube-amp. Similar to Maxon’s OD820 Overdrive Pro, the TBO-9’s circuit features a clean blend function built into the Drive control. At zero Drive, the TBO-9 passes clean signal only along to the Tone and Amplifier stages of the pedal. 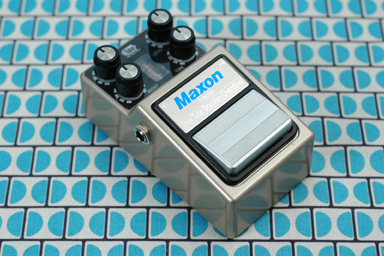 However, this clean signal is fed from the tube section of the pedal, whose gain can be adjusted via the Boost control. As the Drive control is increased, the solid-state distortion circuit is blended with the tube-driven clean signal. In this manner a wide variety of clean boost, semi-clean, overdriven and fully-distorted tones can be achieved simply by manipulating the pedal’s Drive and Boost controls. Both the tube and solid-state sections of the circuit are fed with 30 volts DC thanks to the TBO-9’s internal voltage regulators. Running the circuit at higher voltage provides a more consistent tone with increased headroom and dynamic response. Maxon was the first company to pioneer the use of internal voltage doublers in 9-volt effect units, and this practice is now gaining notoriety with effect enthusiasts around the world. The performance of the tube is kept stable and reliable thanks to Maxon’s unique heater inrush current control, which feeds the tube with a lower startup voltage to extend tube life. The complex multi-voltage operation of the TBO-9 prompted Maxon to develop a unique power supply for this model – The AC2009. The AC2009 provides very consistent high current that is regulated and filtered to provide stable, noise-free power to the TBO-9’s circuit. The AC2009 is auto-sensing, so it can be used anywhere in the world by simply changing out the detachable plug cord on the output side of the PSU. Like all Maxon Nine Series models, the TBO-9 features mechanical true bypass switching for direct, unaltered signal in bypass model. If you crave the warmth and natural dynamic response of tubes, the TBO-9 delivers a variety of true tube tones at the touch of your foot.